With New Line's highly-anticipated IT remake hitting theaters in just eight short days, the young cast members who make up the group known as The Losers Club appeared on ABC's Good Morning America to promote this potential blockbuster. While this movie will be a breakout role for most of these young actors, one of the stars, Finn Wolfhard, is quite well-known already, for playing Will Byers in the hit Netflix series Stranger Things. Towards the end of their interview, GMA's Amy Robach asked Finn Wolfhard which of the two horror icons he's worked with is scarier, Pennywise the Clown, or the supernatural beast Demogorgon from Stranger Things. Here's what he had to say below. "A lot of people have been asking me, 'What's scarier, Pennywise of the Demogorgon?' I thought that, the Demogorgon you could kill, for real, but Pennywise can shapeshift into anything and is kind of immortal, in a sense. I think that's why he's scarier, because he's more of a being." The young actor made these comments during his interview which was posted on Good Morning America YouTube. The Pennywise craze is certainly sweeping the nation, with the theater chain Alamo Drafthouse announcing nationwide clown-only screenings of IT, where the theater will only let in guests dressed as clowns. While there had only been initial plans for one screening at the chain's flagship location in Austin, Texas, more screenings have been added in Dallas, New Braunfels, Brooklyn, Laredo, Omaha, Phoenix, San Antonio and Yonkers, and given the growing buzz swirling around this movie, it wouldn't be surprising if even more screenings will be added. As for the Pennywise vs. Demogorgon debate, Finn Wolfhard does bring up some interesting points, especially since we know that Pennywise will eventually return to the big screen. Like many books by Stephen King, IT was seen by many as too huge a book to ever be adapted as a traditional movie, which is likely why the only previous adaptation was a 1990 mini-series that spanned two 90-minute episodes. New Line Cinema is taking the same approach, with this first IT movie, which clocks in at 135 minutes, following The Losers Club (Finn Wolfhard, Sophia Lillis, Jaeden Lieberher, Jeremy Ray Taylor, Chosen Jacobs and Wyatt Oleff) as they first encounter Pennywise. There is also a second movie in the works that brings The Losers Club back together in present day, 30 years later, when Pennywise surfaces again. 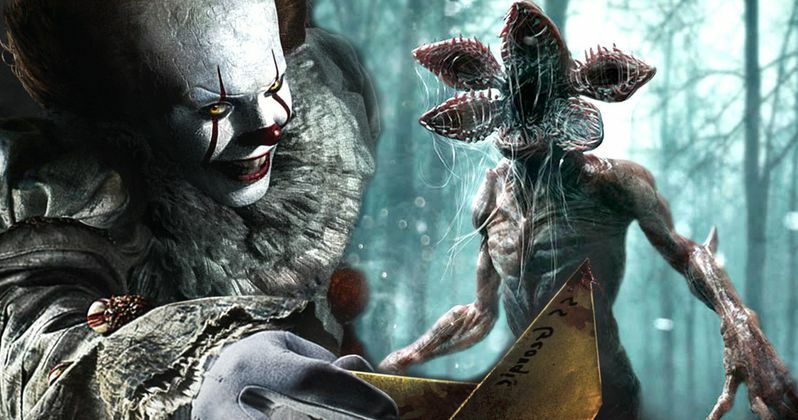 IT also stars Bill Skarsgard as Pennywise, Javier Botet as The Leper, Owen Teague as Patrick Hostetter, Megan Charpentier as Gretta, Nicholas Hamilton as Henry Bowers. Andres Muschietti (Mama) directs from a script by Chase Palmer, Gary Dauberman and Cary Fukunaga, who was originally attached to direct this adaptation at one point. New Line has issued a release date for the IT sequel, but director Andres Muschietti has stated that he hopes to start production next year, so it's possible that we may hear about who will play the adult version of The Losers Club in IT 2 sooner rather than later. While we wait for more on the sequel, take a look at the full video interview with the young cast of IT on Good Morning America below.